Tour of Torfaen 10K & BHF 5K Cardiff - Postponed..
Due to the bad weather conditions, both races have been postponed. Further details will be posted here soon. LCL X/C Pictures..some pictures of today's XC can be found here. Gold medals..have been awarded to Haydn Hartnell & Steve Thomas for the Welsh Inter-regional championship vet category, gained at Cardiff 10k. Well done boys!! 2009/10 LCL series awards ..Islwyn took 1st first male (Haydn) & Female (Ruth) awards in the V45 categories, 2nd (MV40-Steve Thomas), 2nd (Jim Dobbs) & 3rd (Colin Dixon) in the (MV55). See here for a full account of today's X/C at Chepstow, courtesy of Ruth. Well done.. Glyn who completed the Athens marathon & Elaine who ran the 10K race. Full results here. 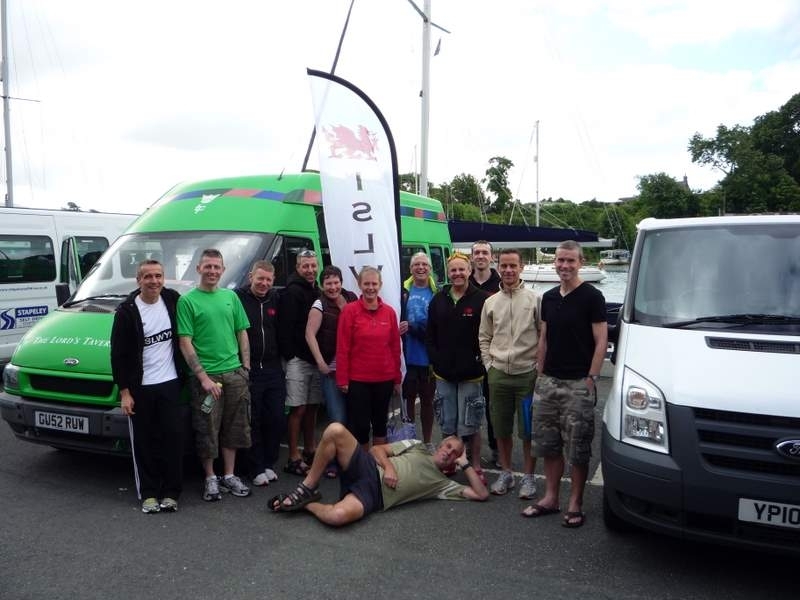 Weekend Update..Well done Kim, Ben & Chris D who completed the Snowdon Marathon. Full results here. Tour of Torfaen ..due to logistical issues, this years 1/2 marathon will be replaced with a 10K race on 5th December. Further details & entry form here. Well done Russell who set a new 1/2 marathon PB at Stroud. Results here. A great turnout for Islwyn at the Cardiff 1/2 marathon today.With perfect conditions we had some great PB's. Please e-mail me here if you gained a PB today. Well done Islwyn. Well done also to Terry & Jim who gained new marathon PB's at Abingdon. London Marathon ballot...Rob Davies & Shona Lewis were drawn for the 2 places. Reserves are Helen Williams, Kelly Waite & Jim Dobbs. Well done Shona who completed the Lochness Marathon on Sunday. Results here. There were 2 main events taking place this weekend, with Islwyn represented in both. Swansea Bay 10K -with 10 Islwyn runners, the race saw Rob Davies already running with another excuse, having yet recovered from last night Stag party, but still managed to run a great time!! Ruth also ran her best ever 10K - fantastic, not forgetting Glyn who is certainly back on form. Results here. 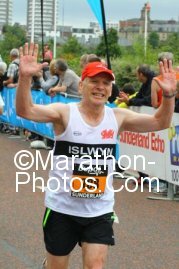 The Wales Marathon - with Russell representing Islwyn in the full marathon, we also had a great turnout in the 1/2 marathon. Russell ran a PB knocking 4 minutes off his previous and Chris Lloyd also ran a PB in the 1/2 - well done! Jim Dobbs once again ran another great race, knocking 3 minutes off his 1/2 marathon PB with a time of 1.35.15 and 17th in his age group. You can check out his photos here for race no 1924. Richard Johnson completed his 1st full seasion of fell running by placing 9th overall & 4th in category for the WFRA. 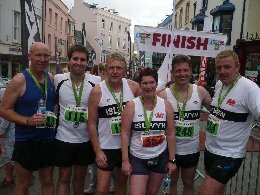 Well done to all Islwyn runners who ran the Cardiff 10K this weekend. We had almost ideal racing conditions with Steve Thomas, Mike Dury & Haydn representing SE Wales for the championship. Despite Rob Davies being full up with a cold and Kelly's returning to racing after injury, both managed an excellent run. PB's were gained by Haydn, Richard and Maria who also gained 4th in the LV35 category, but I suspect there were more, so please let me know (Andrew and Darren)! Ruth also managed to match her Aberdare 10K PB - so well done Islwyn..
Ben is running his very 1st marathon, so Snowdon Mountain Marathon was the obvious choice!!. Ben is running for his mum in support of Cancer Research UK. Please kindly donate here. Russell is running the Wales marathon in support of the National Autistic society. Please kindly donate here. This years event saw record entries. Thanks to everyone who supported the event. Islwyn took 1st male & 1st female vet. Well done to Steve Thomas & Coleen Birch. Results here & photos here. Jim Dobbs who won 1st Supervet in the Great Sunderland 10K. Results here. Jim also went on less than a week later and got a 5km PB at Cardiff Park run, knocking off just under 1 minute. Go Jim!!! See photos and video of Jim crossing the line here (Bib no 708)!! Many PB's set - see Results page for Islwyn times. Well done Islwyn - for winning 2nd Mens & Ladies team prize at Llanwonno & to Ruth who took 1st ladies(V45) and Elaine 1st(V55). Well done to all who ran and supported this years event. It's that time of year again... This year's Christmas Party wil be held at Bryn Meadows Golf Club on SATURDAY DECEMBER 11th. Price is £39.50p/p for a 3 course dinner (inc 1/2 bottle of wine) followed by disco & dancing until 1am. Deposit of £20 per person required by JUNE 15TH to Coleen at the very latest. Congratulations to Sean & Russell who both gained PB's in the Belfast Marathon. Results here. Well done to all who ran in London & Stratford this weekend. 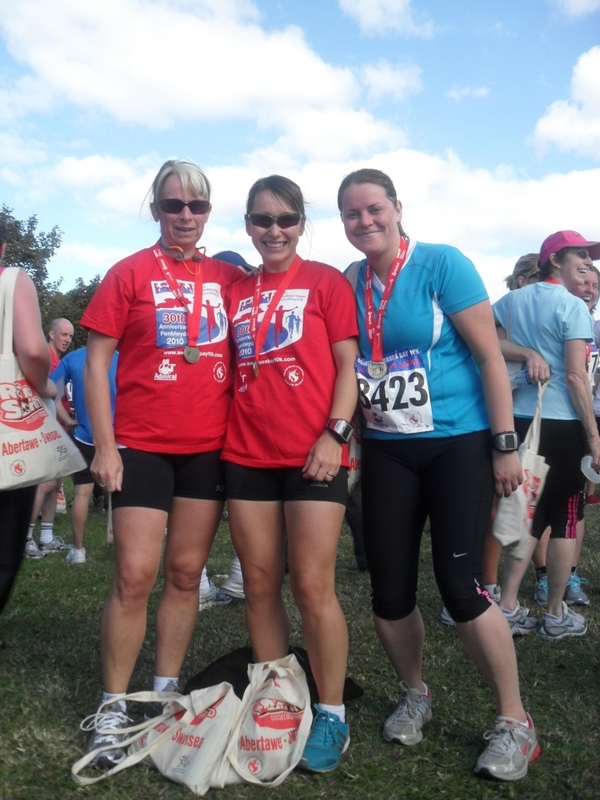 New PB's were set for 2010 & London saw Jackie & Maria complete their 1st marathon. 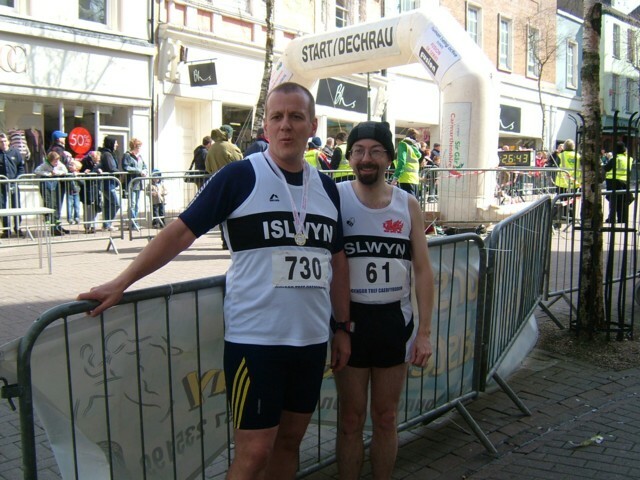 Rhyd & Richard at Carmarthen Mayor's 5K. See results. Congratulations to Haydn Hartnell(MV45) & Ruth Treharne(FV45) for finishing 2nd and Glyn Hicks(MV60) for 3rd in their age categories. Last Sunday saw fantastic results and new PB's from Islwyn at the Llanelli 1/2 & Gloucester 20, not forgetting Julie who ran yet another grueling race at The Grizzly!! Well done to Steve Thomas who placed 4th and Haydn Hartnell who came in 30th at Llanelli. Not forgetting the girls at Gloucester in their 1st 20 miler race in preparation for London. Fanstastic results from all and the added bonus of taking 5th in the women's team prize!! A successful evening enjoyed by all. Thanks again to Coleen & Malcolm for organising. Congratulations to all who received an award, including our 10 and 20 year members.